Family Sharing allows family members to share games while keeping their accounts separate. Family and guests can play one another's games while earning their own Steam achievements and saving their own game progress to the Steam Cloud. It works by granting family members access to games on a shared computer. There are two recommended methods for authorizing shared libraries. Both require that Steam Guard be enabled on all accounts. Log into your Steam account on the computer where you'd like to share your games. Make sure that you have Steam Guard security enabled via Steam > Settings > Account in the Steam Client. 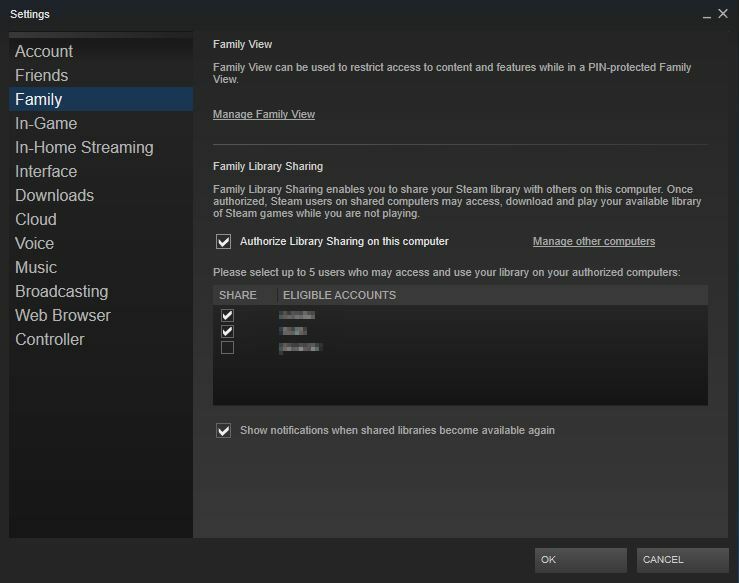 From the Steam Settings panel select the Family tab (or in Big Picture mode, Settings > Family Library Sharing). Here you can select users who have also logged into this computer to share your library with. Click the "Authorize Library Sharing on this Computer" box. Check the box next the account you'd like to share your Library with. Be sure to enable Steam Guard on your Steam Account. From your Library you'll be able to see games owned by other Steam accounts that use the same computer. 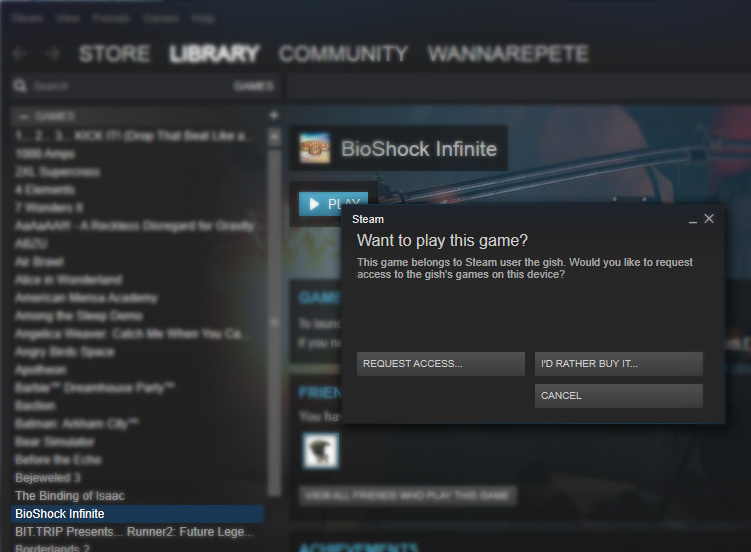 Select a game and click "Play" to request access to that respective Library. Requesting access will send the game owner an email with a link to allow you to play games in their Library. Click the link in the email to authorize that computer and grant their Steam account access to your games. You can log into the Steam client and visit the "Family" tab in Settings, where you'll find a button to "Manage Other Computers..." Here you can deauthorize any computer or account that's been authorized to share your library. Or, you can remotely deauthorize computers from the web. Visit your Account Details online, and then select "Manage Family Library Sharing". Using either the client or the web site, you can view all currently authorized devices and accounts and disable any or all of them. In these same settings, deselect any account from the list of authorized users to prohibit them from accessing your games. Can I share my games with users that don't live with me? I want to play my own games, but they're being played by another account. What do I do? Can I share specific games? Can all Steam games be shared? Is there a limit to the number of accounts I can share my Library with? Can region-restricted games be shared across regions? While Family Sharing can work for users that are not accessing Steam from the same location, due to technical limitations, the feature may encounter issues that Steam is unable to provide support for. As the owner, you may always access and play your games at any time. If you decide to start playing when another user is already playing one of your games, he/she will see a message giving them five minutes to either purchase or quit out of the game. No, libraries are shared in their entirety. You aren't able to select specific games to share or exclude. Additionally, for users that are borrowing multiple Steam Libraries, they will be unable to choose who they borrow a game from. No, due to technical limitations, some Steam games may be unavailable for sharing. For example, titles that require an additional third-party key, account, or a subscription in order to play cannot be shared between accounts. DLC may not be shared if the borrower also owns the base game. Free to play games and any purchased DLC for those games is also not supported for Family Sharing. In addition, if your account has a VAC ban, you will be unable to share any VAC protected games. No, a shared library may only be played by one user at a time including the owner and even if they want to play different games. Yes. A Steam account may authorize Family Library Sharing on up to 5 accounts and on up to 10 devices in a 90 day period. This includes accounts/devices that you have cancelled sharing with in that same time period. A borrower will have access to the lender's games and DLC, but only if the borrower does not also own the base game. If a they already own the game, they'll need to purchase the DLC themselves in order to play it. For free to play games, DLC cannot be shared since all Steam users "own" the game. Any user may purchase, trade, earn, or otherwise acquire in-game content while playing a game, but in-game items cannot be shared between accounts. These items remain the property of the account that purchased or acquired them. Trading cards will not be dropped while playing a shared game. No, any region restrictions will remain in place when lending or borrowing games. Your Family Sharing privileges may be revoked and your account may also be VAC banned if a borrower cheats or commits fraud. In addition, not all VAC protected games are shareable. We recommend you only authorize familiar Steam Accounts and familiar computers you know to be secure. And as always, never give your password to anyone. If you receive a VAC ban, you will be unable to share any VAC protected games. If you are experiencing issues with an entire shared library, it's likely that there is an authorization issue with device or user that was previously authorized. If you are experiencing an issue with a specific game or DLC in a shared library, it's likely that the game is not available for sharing for one of the reasons outlined in the FAQ above. This is always a good first step to ensure that Family Sharing is working correctly. The owner of the shared library needs to access their Device Management page. From there, select "Manage Family Library Sharing" and deauhtorize the device that is giving you issues. Now, the borrower should attempt to launch one of the games in the shared library which will open request to share. Requesting access will send the game owner an authorization email. They need to click on the link in the email to authorize that computer and grant access to the library. A Steam account may authorize Family Library Sharing on up to 5 accounts and on up to 10 devices in a 90 day period. This includes accounts/devices that were previously shared to and have since been cancelled. In order to add a new authorization to Family Sharing after having reached the limit, users will have to cancel an existing link and then wait out the 90 day cooldown period. If you have a new bug or issue that you wish to report, use the Family Sharing Bug Reports section of the Steam Discussion forums. Should you continue to have issues, please contact Steam Support.